Female grayish-tan with red tail and wings. Population density and range of the Northern Cardinal has increased over the last 200 years, largely as a response to habitat changes made by people. However, it is listed as a species of special concern in California and may disappear there because of habitat loss. 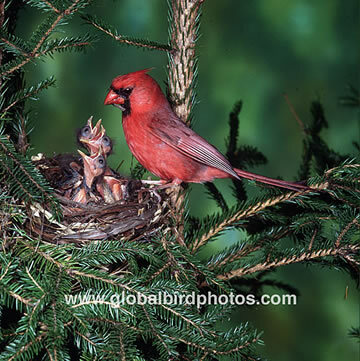 The female Northern Cardinal sings, often from the nest. The song may give the male information about when to bring food to the nest. A mated pair shares song phrases, but the female may sing a longer and slightly more complex song than the male. Brighter red males hold territories with denser vegetation, feed at higher rates, and have greater reproductive success than duller males.